New year’s resolution burnout is so real. How many times have you started the year with great intentions to only find they fall apart after a few months… or even weeks? Especially when it comes to fitness resolutions, it’s hard not to jump in full steam and try to go above and beyond your current level. Everywhere you look there’s someone on social media or TV doing ultra-intense workouts to promote fitness in the new year. The truth is everyone’s body is different and operating at different fitness levels. What may be your limit, may be someone else’s starting point, and that’s okay! It’s important to remember everyone starts somewhere. Even those social media #fitspo queens didn’t start out doing a hundred squats a day. To keep going strong with your fitness resolution, the important thing is to make sure your routine is sustainable— because going hard for two weeks and crashing won’t get you anywhere. This year don’t risk burnout. Try these 6 tips to keep your fitness resolution going strong all year long. Decades of “Feel the Burn” and “No Pain, No Gain” marketing slogans make it seem like sweating hard and feeling miserable are the only physical activity good for your body. When it comes to health and fitness that’s just not true. In the same article, Dr. Stein also reminds us that stretching can help us not only feel better during and after exercise but also help decrease muscle pain and stiffness. Warming up, cooling down and stretching can be major game changers, considering feeling too sore to stick to your schedule is a common resolution roadblock. No one enjoys sitting around in soggy gym clothing! Not only is it uncomfortable (and quite frankly stinky) but staying in your fitness garb after a workout creates a breeding ground for fungus, bacteria and germs. Breakouts and skin infections are sure to put a damper on your fitness resolution so it’s important to find solutions to tackle them before they get started. Changing into dry clothing and cutting down on microbes is key. 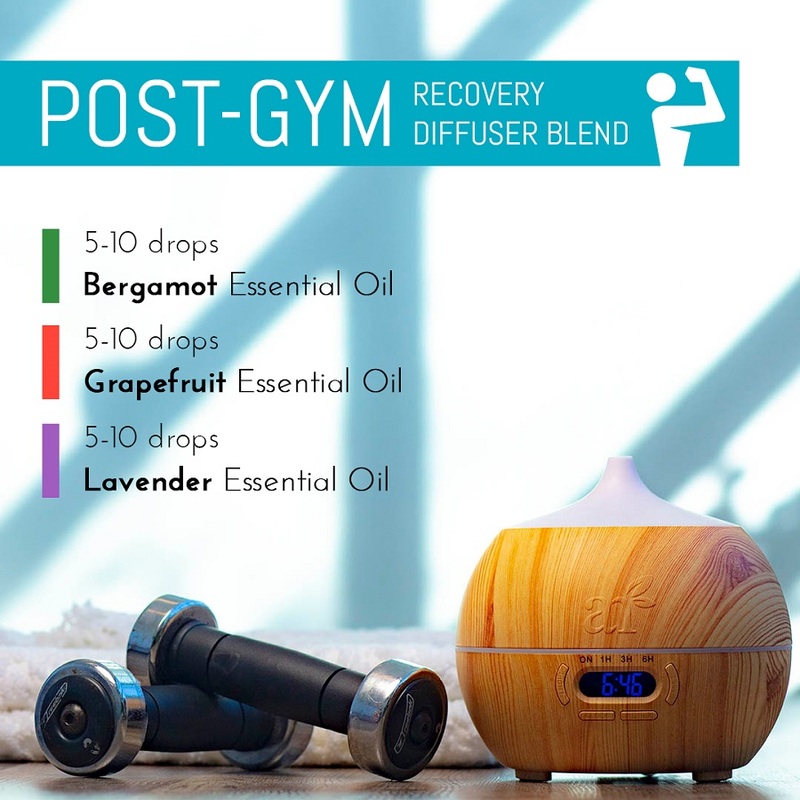 Try this quick and easy DIY essential oil spray before changing into dry clothes post-workout to avoid picking up extra germs at the gym. Tea tree oil one of the best essential oils to use for keeping germs at bay. You can also use this spray to keep fitness gear like yoga mats and gym shoes clean and odor-free. In spray bottle combine witch hazel and tea tree essential oil. Shake gently to mix and again before each use. To use on body: Towel off sweat, spritz essential oil spray over body and feet and pat dry. * To use on gear and equipment: spritz essential oil spray on and wipe off with clean cotton or paper towel. *Don’t forget to always do a small skin patch test before using any new product. Everyone’s body is unique so it’s difficult to predict allergies and sensitivities. Dehydration can lead to sore muscles and even bad skin! To keep yourself feeling great, and more likely to stick to your fitness plan, make sure you stay hydrated. This means getting plenty of fluids before, during and after fitness activities. For moderate exercise, good old-fashioned water will usually do the trick. If you get bored with it, you can always add a slice of cucumber or lemon for a flavor boost. You can even keep a jug of cucumber lemon water in the fridge for convenient post-gym refreshment. For very intense workouts, it’s generally a good idea to replace lost fluids as well as lost electrolytes to rehydrate. The best liquids for rehydrating include carbohydrates, sodium, potassium and magnesium. If you’re not a fan of those neon sports drinks (with who-knows-what in them), try this delicious natural sports drink recipe to rehydrate. 1. In pitcher, mix water and sea salt until salt is fully dissolved. 2. Use your handheld or electronic juicer to squeeze the juice of 2-3 oranges, strain or pick out any rogue seeds. 3. Add fresh orange juice, raw honey, and calcium magnesium powder to sea salt water and mix well. Lasts 3-5 days refrigerated. Another common mistake that leads to abandoning fitness goals is focusing on skipping meals and cutting calories to achieve weight loss. Your body is a well-ordered machine, and like any machine it needs to fuel to function. Post-workout nutrition is super important to help reduce muscle soreness and give your body the fuel it needs to replenish and rebuild muscles. So don’t skip a snack after the gym! Just help your body get the nutrients it needs. Some great foods to consider for your post-gym nosh include sweet potatoes, oatmeal, rice, dark leafy green vegetables, greek yogurt, eggs, cottage cheese, salmon, chicken, tuna, nuts, avocado and trail mix. Hot baths are great for relieving muscle soreness by relieving tension, but the soreness that comes from your fitness routine is not the same. There are many reasons to take a cold shower, but post-gym recovery is the most important to sticking to your fitness resolution. It might seem hard to get hyped up about taking a cool shower instead of a hot one, but you can help make it more fun by adding essential oil aromatherapy. Making natural, gentle bath and body products with essential oils is much easier than you might think. For a post-gym cool down you’ll actually look forward to, try this uplifting essential oil body wash recipe. In under 5 minutes you’ll have your own custom body wash to keep you motivated and focused on your new year’s fitness goals! 1. Combine essential oils and other ingredients in bowl. Gently whisk until thoroughly mixed. 2. Transfer essential oil body wash mix to squeeze bottle. Lather and rinse in shower as usual. Pin this essential oil diffuser blend so you always have it handy! Allowing your body to recover after exercise is an important part of physical fitness. When you fail to incorporate rest time in your fitness routine, you’re increasing your chances of injury and missing out on significant physical benefits. Not resting may seem like working harder and doing better, but it’s really setting yourself up to fall into two traps that can easily derail your fitness resolutions: getting injured and not seeing the results you expect. Giving your body time to recover may mean taking a day off, or simply switching exercises to engage a different set of muscles. Whichever recovery road you choose, it may be hard to help yourself rest and stay in a positive, motivated head space. It’s also important to get plenty of sleep to feel your best. To keep yourself in a positive, yet relaxed and comfortable mood try this essential oil diffuser blend. Bonus, it smells terrific!